Handrail is an important aspect of any staircase regardless of either meant for aesthetic or safety. There are various kinds of handrails in the market that one could choose from depending on personal preference. These kind of handrails are mostly made of round, rectangular or square metal pipes. They are known for their strength, durability and low maintained. Examples of metal handrails include brass, aluminium, chrome and stainless steel. Additionally, metal handrails also tend to mostly have an industrial style design. However, they also can feature other designs. Even though expensive because wrought iron is a speciality material and classified under one of the most expensive construction material, these kind of handrails are fantastic for ornate looks. They are a very popular form of handrail because they can be used differently. They can be used to either give that traditional look if used on they own or to create an ultra modern look when mixed with metal. These kind of handrails can just be made from any type of wood which gives room for one to select the kind that compliments their appeal as well as décor. Examples of wood types that are commonly used include pine, mahogany, eucalyptus and cedar. However the choice is limitless. Perhaps something to note about wood handrails is that their costs vary depending on the kind of wood one chooses and also their maintenance generally is higher as compared to other kinds of handrails. Glass handrails are relatively new to the construction industry. Even though they are rarely used due to their fragile property, they create a contemporary open look which gives perspective. When going for glass railing perhaps, consider safety glass and not the other common types of glasses because they are reinforced which makes it hard for them to break. 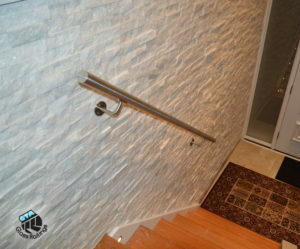 Custom handrails are handrails made from a mixture of any of the materials mentioned above; wood and metal. Metal and glass, wrought iron and wood or whatever combination one chooses. Since we all know that anything customized is expensive, these kind of handrails are expensive. Therefore, if maintenance and cost are not a concern then this option is right for you. Also the key advantage to this kind of handrails is that they can be adjusted whichever way one wishes blending with your home style and décor perfectly. There is also a lot of scope when it comes to design!